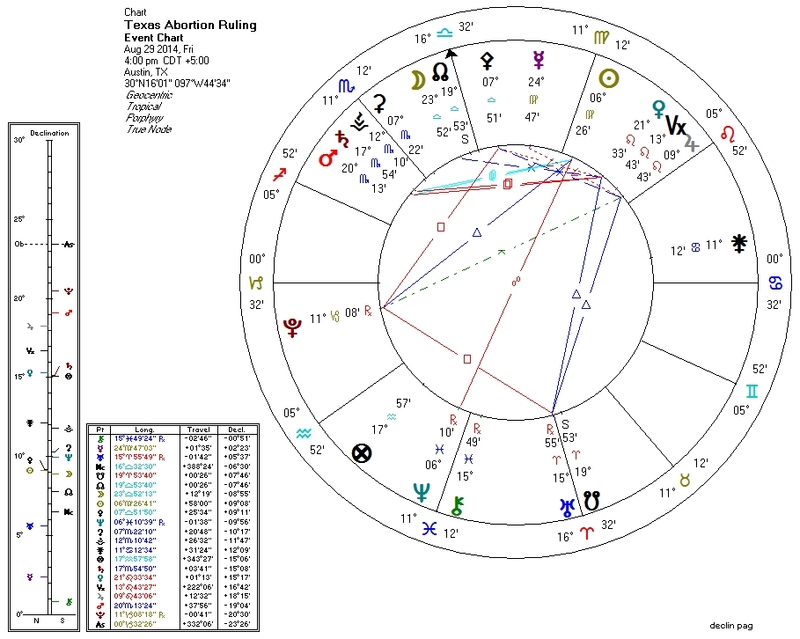 During last year's Texas abortion battles, it was Jupiter in Cancer opposite Pluto that seemed to be the astrological trigger. For yesterday's ruling, Jupiter was long out of the sign of family and motherhood. Taking Jupiter's place in the "hot seat" in Cancer opposite Pluto is... Juno? What the heck does Juno do? (It took me years and hundreds of charts to figure out something about how Pallas works. I don't perceive that anyone's done that level of homework on the other asteroids). The Nodes have an ambivalent relationship to the Moon on this one. The North Node is conjunct the Moon... but the South Node is on the IC. Is the ruling pro-woman or anti-woman? According to this charts, it's both. Pallas, goddess of the non-initiation of force, is also ambivalent. She's square Pluto (which weakens her) but parallel the Sun (which strengthens her). This latter aspect coincides with the latest Israel-Palestine cease-fire, which isn't making headlines because the overlords of the news have all determined that we're tired of hearing about Israel and Palestine for now. Maybe they're right. Pluto, god of death, is arguably the star of the show in his First House perch. He's square the nodes, suggesting that his domain of death is a subject of current contention. Pluto currently rules the Mars-Saturn conjunction in Scorpio, evoking images of struggle (Saturn) over action (Mars) in the real of life-versus-death (Scorpio). I have no position on abortion. Libertarians similarly are split. My suspicion is that Pallas doesn't like laws restricting abortion (I need much more data to be sure) but I have no idea how she views abortion itself.